It is a bold and enterprising move to just present such material. 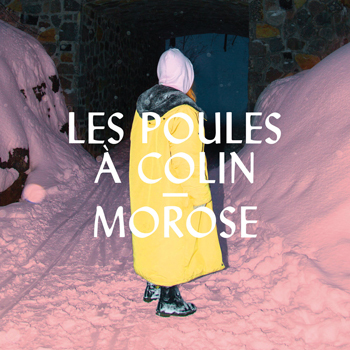 Les Poules à Colin is a whimsical name for a band, but not an uncommon one, given the propensity for the whimsy – and sometimes noir humour of the Québécois. The music of Morose covers a wide swathe of sensibilities and is superbly rendered from the delicate tracery of the banjo and mandolin as Béatrix Méthé and Sarah Marchand sing forlornly of love in “Morbleur, Sambleur!” to virtuoso instrumentals such as “Condor”. The music is full of life and colour, and with throughout we can appreciate the individuality of the musicians (and the guests) of Les Poules à Colin’s harmonies and of the beauty in which the music’s lyrical and narrative worlds collide. Much of this has to do with the allure of both vocalists Béatrix Méthé and Sarah Marchand. But the instrumental skills also have much to do with the beauty of this music; the languid ease with which the guitar, violin, banjo and mandolin melt with each other creating an irresistible rhythmic event that seems to spiral from song to song, to each new climax. While there is much to beguile all through the music of this album, one is especially mesmerised by the two vocalists who shape the bittersweet beauty of the songs. They do this in their faultless sense of phrasing and compelling in their often breathtakingly forlorn lyricism which sets the music aflame as the instruments thrum resonantly alongside. It is an album of exceeding enchantment.